Bonded storage - Mainport Warehousing B.V.
Bonded storage of your marine spare parts at our warehouse in the port of Rotterdam is an easy and efficient solution. 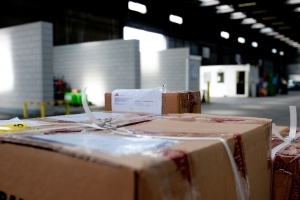 Our warehouse are located in the very heart of the port of Rotterdam. So delivery from the warehouse to your vessel can be efficiently done. Take a further look at our website for more detailed information about the possibilities for bonded storage, and give us a call if this leads to any questions. Besides the proximity of bonded storage facilities near the unloading areas at Rotterdam port, our warehouse is also located near important transport routes. Roughly 1 kilometre from the A15, Mainport uses this important transport artery to efficiently transport your cargo to its final destination once its been cleared for customs. Besides transportation by road, rail- and deep-water connections are also located in close proximity to our bonded warehouse in Rotterdam. Contact Mainport for more detailed information about the efficient and fast solutions that we offer your business. Personal contact is always preferred of course, however, due to the international character of your business, and ours, contact by phone is possible as well. You will reach us by calling at +31 (0)10 495 4360.